Throughout 1947 George Pal achieved successes that had nothing to do with his marquee star Jasper, and his accomplishments validated his expansion beyond the Sambo-figure. Pal’s John Henry and the Inky-Poo won an Academy Award nomination. As with last year’s nomination, Pal lost to “Tom and Jerry” again–this time to The Cat Concerto. 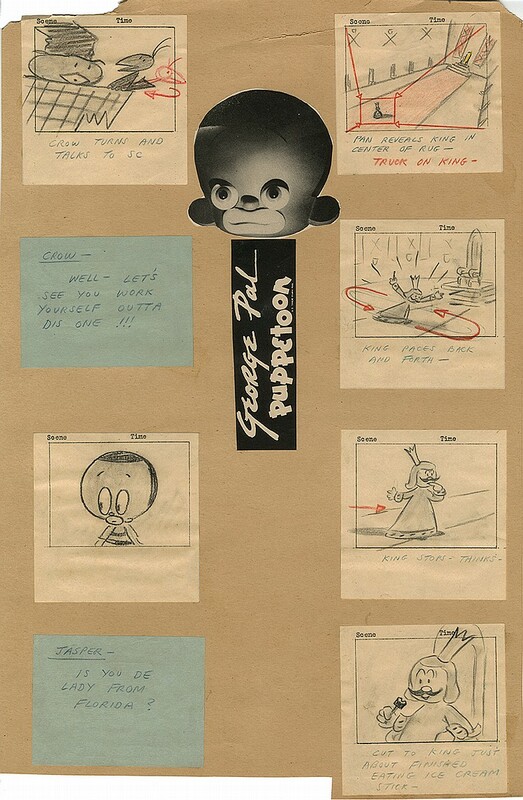 In an earlier point in Pal’s career, the nomination may have signaled a new direction towards dramatic puppet-animation of African American folklore and novels. But that was ultimately not to be. In April 1947 James M. Jerauld reported in Boxoffice that Pal was entering feature-film production and working on Tom Thumb for release through United Artists. As a consequence, the filmmaker’s “Puppetoon” series for Paramount ceased production. This shutdown meant the end of the “Jasper” series, but the ethnic images in those cartoons received a rebuke that year from the African American magazine Ebony. On the other hand, Pal would not make more episodes like John Henry and the Inky-Poo, which received critical praise from Ebony, Hollywood Quarterly, and other periodicals. Paramount Pictures released the last of the “Puppetoons” in 1947. Of the five releases, only one stars Jasper. In Shoe Shine Jasper, the boy, the Scarecrow, and the Crow appear for the final time together. In a break from the standard “Jasper” story formula, the “Jasper” finale is a parody of Cinderella. Instead of a fantasy-laden story about Scarecrow’s scheming, Shoe Shine Jasper casts Scarecrow as a bully leaving home for a jitterbug-dance contest but ordering Jasper to stay behind and shine shoes. A fairy godmother gives Jasper magic golden slippers so that he can enter and win the contest, which he does. The first few minutes are quite dialogue-heavy in order to set up the plot. However, the animation of the dancing by the contest participants, the Scarecrow, and Jasper is superb. Some effort seemed to have gone into animating the jitterbug with some accuracy, and the music sounds as “hot” as any jitterbug score could sound. However, the characters speak in the stereotyped dialect, and they have big lips and big eyes. Thus, Pal’s attempt at new storytelling for Jasper did not deviate from its fundamental roots in ethnic caricature. In contrast, the penultimate “Puppetoon” release of 1947–Date with Duke–eschews ethnic caricature entirely while still casting an African American. The film is a musical that combines live-action and animation. Duke Ellington stars as himself, performing “Perfume Suite” on the piano in live-action form. The puppet-animation comes into play when perfume bottles on his piano come to life and sing and dance. Date with Duke did not receive the Oscar nomination that Pal had hoped for, but it won kudos from critics. Both Shoe Shine Jasper and Date with Duke present African American jazz music in extremely different ways, especially concerning African American representation. The latter film showed that African Americans did not have to be subjected to ridicule in order for their music to receive animated treatment. The episode marked the coda to an era that had already ended. By 1947 two years had passed since Universal Pictures issued the last “Swing Symphony” from Walter Lantz, and Bob Clampett’s stabs at jazzy ethnic caricature for Warner Brothers had taken place even earlier during World War II. After the last of Pal’s cartoons, African American caricature became more conventional–more maids, porters, and farm hands. … although we still had Tom & Jerry in HIS MOUSE FRIDAY (among a few other cannibal reels like CHEW CHEW BABY extending into the Eisenhower Era), a key reason why we don’t have a “Tom & Jerry Golden Collection Volume 2” on DVD yet. Hopefully the low key release of “Popeye The Sailor The ’40s Volume 1” with enough warning in its opening screencap for unsuspecting viewers, mainly concerning its own cannibal reel, will increase the Warner Media Company’s comfort level over such things getting released. Actually, the key reason we don’t have Tom and Jerry Golden Collection Volume 2 on Blu-ray/DVD is the blackface scenes in “Mouse Cleaning” and “Casanova Cat”. There was never any indication that “His Mouse Friday” was a problem when the second Golden Collection was put together — and remember, it was included in the announced contents list for the set whereas those two other shorts were not. Arguably, “Friday” is more offending than either of the two T&J cartoons that Warner’s office has a problem with… but that just goes to show how hypocritical their stance on those two cartoons is. Disney had cannibals as late as 1954 in the Donald Duck cartoon SPARE THE ROD, as well as tribal ants in TEA FOR TWO THOUSAND and UNCLE DONALD’S ANTS (1948 and 1952, respectively), with the latter having a brief Stephin Fetchit gag. And TOOT, WHISTLE, PLUCK AND BOOM had minstrel banjo players. Yes, I noticed too that HIS MOUSE FRIDAY was curiously less upsetting to the higher-ups in charge of DVD distribution than MOUSE CLEANING and others, although I have this curious feeling that MOUSE CLEANING did make the VHS cut back in the 1980s. Unfortunately my memory is shot. Also Disney had quite a few “native” stereotypes lingering into the fifties. Fortunately the ones in SOCIAL LION are pretty brief… blink and you miss them. Not to mention the Jungle Cruise at Disneyland took an awful long time to become more socially “correct”. Granted, we just had stock “African” masks and no faces there. I guess one must admire James Mason viewing them as human beings in 20,000 LEAGUES UNDER THE SEA and only temporarily shocking them off of his submarine. Was that Walter Tetley (Andy Panda, Peabody’s boy, Sherman) as the first perfume bottle? Thanks Christopher! I’d never seen Date With Duke before. (I think; we actually got to see Puppetoons on broadcast TV in the mid-late 50s.) Is Shoe Shine Jasper available to view anywhere? Your Puppetoon posts are a great read. I recall “Date With Duke” showed up a lot on AMC (back when it was the AMC I knew and loved) when they used to do a Saturday morning thing of showing shorts and other materials. What about ROMEOW AND JULIECAT ? As a Puppetoon fan, I had plenty of questions for Bob Baker when I had the chance. Bob told me that the reason Pal shut down Puppetoons was because of the Screen Cartoonists Union. They wanted to unionize the studio, but there was so much overlap in what the animators did, from setting lights to running their own cameras, that it was impossible to categorize them. Plus the revenues from the shorts were not enough to cover increased production costs. For those who might care, “A DATE WITH DUKE” could be found in full restoration on the existing blu-ray edition of “THE PUPPETOONS MOVIE”. It was one of the seven full restorations as special features, along with all the extras found on the DVD release that came previous to the extended blu-ray edition. 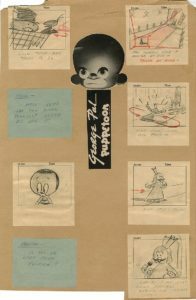 An even more expanded restoration project around “THE PUPPETOONS MOVIE” and PUPPETOONS in general is underway and it is my hope that “A DATE WITH DUKE” and many other titles from the series that have not been seen in good quality for years will also be included, along with further interviews and documentaries on George Pal’s work. Right now, I can’t recall “SHOESHINE JASPER”, but I’d love to hear its jazzy score. Pal’s stop motion animation was unique in the sense that, no matter what the character or situation, the reactions were so close to what Tex Avery would later create as 2-D animation…at least that is how I remember these shorts when they were broadcast as part of teh same show that also aired many of those classic MGM cartoons, from Harman/Ising through the afore-mentioned Tex Avery-directed titles. Thanks for these posts on the JASPER shorts and how they were received in their time. Can you tell us more about what is on the Blu-ray that is not on the DVD? Thanks. I can’t adequately express my gratitude for the posting of this masterpiece. It combines the work of two utterly superlative artists: Duke & George. It’s a shame that for ’47, the audio’s not up to the highest level of what was then being professionally accomplished. A consolation is that at least, there are no audible remnants of ‘noise supression’. Duke was a classy man, even in the manner in which he died: working on compositions and arrangements in his hospital room up to a few days prior to dying from cancer. If you’ve not yet heard it, check out “Black, Brown & Beige”. It was issued on RCA Victor on two, two sided 12″ 78 rpm disks circa 1943.